Increase in the complex structure of technology not only benefits us but is also empowering the threat sources to use them for all negative reasons. Because of which security systems need to be more invulnerable when implemented. Biometric authentication is one of such solution, we all know biometric talks beyond something that you know or you have, but as of now, it is unimodal only which authenticates using the single source of information. Now more and more organizations are moving towards implementing the multimodal biometric authentication, which uses two or more inputs for authentication purpose, for a more secure environment. A multimodal biometric system increases the extent and diversity of the input which system takes as information from the users for the authentication purpose. Biometric authentication now not left limited to the systems only which are installed at one single place, now it is also available by the means of wearables like Smart-watch. It’s interesting where it works on sensing the environment and the person who is wearing it. 1. Instant mechanism of authentication – As we said earlier biometrics talks beyond which you know or have and that is “what you are”. You can’t change yourself, your behavior, your traits, or your senses, they will remain as is. Different smartwatches are available in the market with many distinct features but all work or rely on your senses. If we integrate the biometrics authentication with smartwatches, then what would be the scenario, you don’t have to stand in front of the systems, once you are around the system, it will automatically authenticate you. As it would be gauging your senses, once you remove it, a connection will get lost. I know many of you would be thinking, what if somebody threatens us and get the access. You forget we told “Senses”, every device needs a programmable pairing, if any of your senses are different from the recorded one, then it would not allow the access. So, implementing biometric with smartwatch provides not only an instant mechanism of authentication but at the same time more secure too. 2. 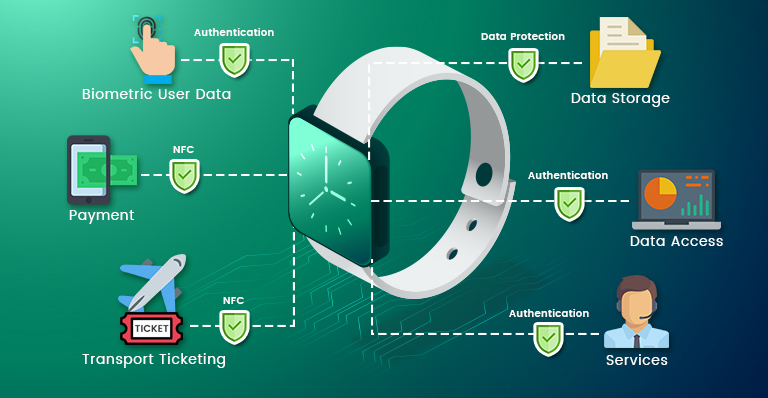 A Trend of sensor integration – A Smartwatch biometrics tries to measure those aspects which define who and what you are, that further can be used for the purpose of authentication. As your senses are under your control only nobody else could do the same, which makes the authentication more secure and stringent. The sensor integration is critical and complex but with Smartwatch, implementation can be easy because it’s a wearable which records the senses like an accelerometer used to measure your gait or a heartbeat sensor to count the heartbeat rate, and always with you so it would be easy to get the sensor integration done. 3. Easy pairing to your Smartphone – All devices are now coming with portability to get them paired with other devices, the same can be done in case of smartwatch and a smartphone. They both can be paired in a way if anything abnormal is being recognized by the smartwatch with its sensory mechanism, then an emergency call can be initiated to the specific person, whose number is defined under emergency contact. 4. Helping in building intersecting architecture for security – The development of any biometric device or technology is built over a comprehensive architecture, which carries many layers of security. Integrating the biometric with Smartwatch will also allow two different underlying architecture of the technology to talk seamlessly, which also opens the door for many other developments. 5. Challenges – No technology comes easily while building they have challenges associated with them. The same applies here also, identifying the correct sensor mechanisms need a detailed working as the factors associated are related to the human and their psychology, which needs to be studied thoroughly from the implementation perspective and later identifying what combinations of factors can be worked upon. As of now biometric and Smartwatch are independent, where human factors are also working independently. But now as we are visualizing the same to combine, they need close to close introspections. And now, at last, we just want to say combining the existing multimodal biometric authentication factors which Smartwatch technology will definitely result in the system which not only safe & secure but is nearly impossible and impractical to fool.